Particulate matter from incineration of nanowaste – is it toxic? People in modern societies produce a lot of waste. I propose that you think about it next time you buy something. How much of it is comprised of packaging? How much of that packaging is recyclable? How much of it will become waste after a short while? With the fast advancement of nanotechnological applications to enhance consumer products, we can expect nanomaterials to become ubiquitous in our domestic waste. So what happens when we burn nanotechnology-enhanced waste (or nanowaste)? Unlike that great Jerry Lee Lewis song that everybody knows, the answer to this question is a little bit more complex. Most modern incinerator facilities are equipped to minimize the emission of air pollutants from the incineration process, especially particulate matter (also known as fly ash). But what if some nanomaterials lead to the production of different pollutants during the incineration process? As we know from this blog, nanomaterials are multi-talented. Some have the ability to catalyze reactions, which can lead to the production of potentially toxic combustion by-products. There are many locations around the world that perform open burning to dispose of waste. Therefore, it is possible that air pollutants generated may be slightly different if the waste contains nanomaterials. 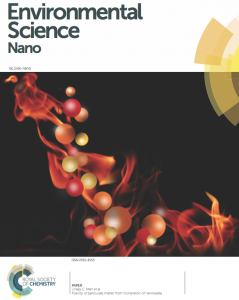 In their most recent work—and ES Nano cover article—Vejerano and colleagues evaluated the toxic response of fly ash from waste that contained a wide variety of nanomaterials, such as nanosilver, titania, ceria, fullerenes, quantum dots, and more. They found that waste that contained nanosilver, titania, and C60 fullerenes led to a toxic response in human lung epithelial cells, which is signalled by an increase in the production of reactive oxygen species (ROS). But, in addition to that, this study also shows that the presence of nanomaterials in waste is not expected to significantly alter the environmental and health risk of the fly ash emitted from combustion processes. Marina is a PhD research scientist at Virginia Tech and Assoc. Director of @VTSuN. She is interested in air quality, nanotechnology and health. You can find more information about her in her website mevance.com.